An artist designed the removable steampunk case for the gaming laptop. The computer keyboard also was steampunk'd. What happens when you combine a laptop nicknamed The Beast with a subculture that is sweeping across the nation like a maelstrom? Sony has been steampunk’d, and the company asked for it. Marrying modern technology with an elegant Victorian aesthetic is what steampunk is all about. So when social commerce specialist Reena Leone, a relative newcomer to Sony, decided to spruce up her geeky workstation with another subculture twist, steampunk seemed liked the perfect solution. But she didn’t want to just “glue some gears on it and call it steampunk,” as the viral video goes. Leone needed a fully functioning VAIO F laptop she could use for work, with steampunk incorporated in the casing, utilities and desktop. The finished product, featured in a video from Sony on its Web show, "SGNL," has been making the Web rounds. More than a few people want to swipe that steampunk laptop right out from under Leone, but she’s only willing to let it travel to cons and shows for now - no house calls allowed. CNN Geek Out chatted (and yes, geeked out) with Leone for a few moments about her new steampunk laptop, and talked about if Sony is really considering more subculture mash-ups in the future. 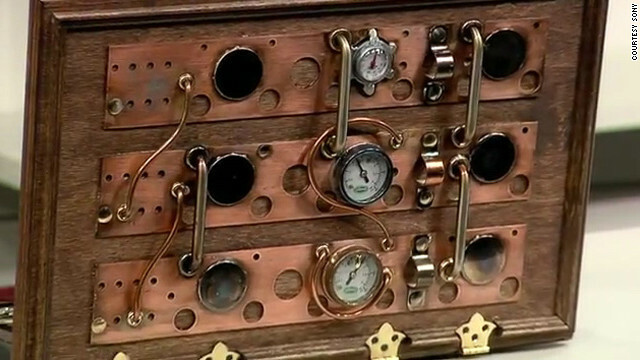 CNN Geek Out: How did you come up with the idea of the steampunk laptop? Reena Leone: I’m online a lot, and I’ve really tapped into the geek community. One of the main steampunk artists, Datamancer, had done a steampunk laptop prototype a while back, and there was an announcement over the summer that he was going to start producing them and people could order them and have their own. I had just started working here around that time, and I actually have a VAIO F.
So I was like, "you know it would be really cool if I actually had a steampunk laptop to go with my geeky desk setup I have here." And we have this online show called "SGNL," so I came up with the idea, pitched it, and they gave me the green light to go find someone to do it. I did try to get Datamancer to do it first, but he was slammed with his own line, so I jumped on Etsy to see if I could find an artist who could take on the project, and that’s how I found John Dunn. CNN Geek Out: Why the VAIO F? Leone: This is our largest laptop model, so there is more space to work with and more ability to put gears and copper and wood and things on it, so it has more surface area. It’s our super gaming laptop. A lot of people refer to it as The Beast, myself included. It’s quite a powerhouse. When I approached him about doing the project, he went to the Sony store and checked out the laptop first before agreeing to it to see if it would work. And the flat surfaces that this laptop has made it easier for him to attach things, and then he found out the keyboard was backlit, and he had been meaning to try out this idea for translucent keys, so he was really excited about that, too. CNN Geek Out: Have you seen steampunk incarnations of other tech products? Leone: Yes, there’s actually quite a community. Even the artist that we used usually does cases for tablets and iPods. A lot of people have also been doing cradles and chargers so they can attach an iPod or MP3 into it, and it has a steampunk feel for the smaller devices that don’t have as much surface area to play with. I go to Comic-Con every year, being here in San Diego, and there is always a variety of crazy steampunk gadgets. CNN Geek Out: What kind of response have you received since you put out the video featuring the laptop? Leone: It’s been overwhelmingly positive. I’m actually pretty psyched about it. I know it’s a subculture, but I wasn’t entirely sure how well it would translate originally to the group in general, which is very tech-savvy and gadget-focused. A lot of people have asked if it’s for sale. No, it’s mine! I get to keep this one. There has been a lot of talk about the widgets from the video, and I got in touch with Dean Beedell, who made them - they’re free Yahoo widgets. He’s been interacting with the community, too, and people have been downloading those. So it’s an easier way, and it doesn’t void your warranty to have that steampunk feel on your own computer. CNN Geek Out: What did the folks at Sony think about steampunk and modern tech together? Leone: They thought it was pretty cool. I think they took a leap of faith with me a little bit, just because a lot of time and effort goes into the design of our laptops, so it takes a little convincing when you’re going to alter something that took so much time and thought. Other than the keyboard itself, the top part comes off. It was only the keyboard that was truly modified. The laptop is fully functional! The keyboard totally works, everything functions the same as the standard VAIO F. I showed them a bunch of examples that helped, and I think they took it on my geek advice that this would be a cool thing to do. There really wasn’t much hesitation in letting me do the project. I think that’s because being an electronics/tech company, there is definitely an innovative spirit here. I’m lucky to be around a lot of creative people so when I pitch sort of out-of-the box ideas, there is a lot of support, which is great since I’m still kind of the new kid on the block. CNN Geek Out: Are you planning any other steampunk technology mash-ups in the future? Leone: We’re talking about it, and it’s definitely a possibility. We might do something with it in 2012. the laptop has traveled to CES, so it’s on vacation right now. That laptop will probably make the rounds, and then we can talk about doing things with other products. We love old and new. We like to have a sense of history anyway, so doing something like this really fits in. Filed under: Brainiac • Master User • Squee! Howdy very nice site!! Man .. Beautiful .. Superb .. I will bookmark your site and take the feeds additionally?I'm happy to find so many helpful info right here in the submit, we want develop more strategies in this regard, thank you for sharing. . . . . . Attractive part of content. I just stumbled upon your web site and in accession capital to assert that I acquire actually loved account your weblog posts. Any way I will be subscribing on your feeds or even I success you get entry to constantly rapidly. Wonderful submit, very informative. I wonder why the opposite specialists of this sector don't realize this. You must proceed your writing. I am confident, you've a huge readers' base already!|What's Going down i am new to this, I stumbled upon this I've discovered It absolutely useful and it has aided me out loads. I am hoping to give a contribution & assist other users like its helped me. Great job. Yes you can use them to write checks get cash etc. BUT it is a huge miakste!Rip the checks up ASAP they give you 6 months with 0% interest but charge you a fee to cash the check and they know you can't pay it all off in 6 months. They will get thier money from you don't fall into this credit trap!Live debt free! It is a wonderful feeling. I had fun working on hadsntands today. Eric Sweet was spotting me and we were talking about Fran. He mentioned that he was going for a sub-3 minute time. I probably gave him an awful looking face and he gave me some great advice. Something along the lines of you just have to deal with the pain. It's going to hurt but you just have to work through it with the knowledge that you'll be done soon if you push yourself through it. I set a PR, 3:36 RX which is 1:25 faster than the last time (he got his sub-3 minute time by quite a bit, it was unbelievable).Push through the pain everyone! Happy Fran day. An outstanding share! I have just forwarded this onto a coworker who had been conducting a little homework on this. And he actually ordered me lunch due to the fact that I discovered it for him... lol. So allow me to reword this.... Thanks for the meal!! But yeah, thanks for spending some time to discuss this matter here on your web site. Fallout series for the win. SORRY Sony – but with 3 home theaters and projection rigs, 4 computer workstation locations and one of which is 5 rigs and screens in one combined gaming station that looks like Darth Vader's command pod, you can rest assured that I have not, and will not, buy any Sony products since the horrific destruction of SWG that impacted and devestated hundreds of thousands of Star Wars fans, and your recalcitrant position, only admitting to your blunders years later, and never correcting them. Never again, Sony. Never again. Not a huge pc gamer, but can't deny, really want this laptop. The one above doesn't even compare. Oddly enough it is by the same people. Check the link in the answer to the first question. Goes to that website and talks about that laptop. I like the 3 plates that you stick copper tube through when piping sinks to hold the hot and cold lines in place when stubbing out through the wall. All this talk about what laptop they used, but only ONE lousy picture of it? What gives?? This trend is as ugly as dog vomit and completely retarded. Really? Just because you don't like it doesn't mean other folks can't enjoy it. Grow up. Oh Rob, what do you know? Obviously nothing. I happen to love the Steampunk look and have been following it for 15 years. It looks like it was built with 1880's tech. Very cool. I am preparing to Steampunk an old monitor as my first project. I'll be duly embarassed if it turns out as poorly as what is pictured here. Go for understated elegance instead of pipes and dials. What?! This article is still here?! Take this poor representation of steampunk DOWN! Kitchen cabinet with crap on it. AWESOME!! How about more pics or ....uh oh, a VIDEO? Apparently, the editor/writer of this article is thoroughly unqualified to cover this style. Meh, it's just some wood and non-functional tubing attached to the case. To really qualify, it needs to have something more functional, like a set of ratcheting gears that opens the lid when you press a lever, or analog gauges that indicate processer, speed RAM utilization, or disk access. Oops, malfunctioning punctuator and spellotron *should* have typed "processor speed, RAM utilization, or disk access". Getting rid of all the non-functional c rap and sticking to straightforward period-specific design would have worked a lot better. A simple mahogany case, with joining where joining needs to be and possibly brass in high-wear, high-stress spots would have been significantly more successful. One thing often overlooked about Victorian era engineering design is how extremely minimalist it can be. Despite the claim that he didn't just glue some gears on it, it looks like something he just glued some gears on. It's all pointless decoration that serves no actual purpose, and doesn't even hint at one. All the great steampunk stuff in the world and this JUNK makes the cut. Come on. This is the type of pitiful craft-work that would give any genre a bad name. It's true that this feature writer knows nothing about Steampunk, regardless if she considered the Sony connection a genuine news article. How pathetic! But it's giving us an opportunity to educate people, so it can't be all bad. Publish and be damned, just spell my name right. I'm forced to disagree, as readers see this post and assume that all Steampunk design is as awful as this picture. This does a great disservice to a burgeoning and exciting new style. In his work, Dunn has simply copied all of the great Steampunk artists of the last seven years..... and he did it really, really poorly! Shame on him and Sony and for CNN for covering such a copy cat. I regret to say that I would like to have seen it rendered with quite a bit more finesse and a better design sensibility. From the amateur wood finish to the hodge podge of hardware store items, it's poorly designed and assembled and NOT AT ALL representative of great Steampunk design. Who wants a bigger laptop? Laptops gotta be lighter not bigger. They are pretending that it runs on steam, or springs, or phlogiston instead of using electricity, as if the technology came from the 1800s. Completely the opposite of 'no moving parts.' Remember, this is not actually serious. And yeah, I've seen better stuff. The fact that CNN /quote "geeked out" over it /endquote indicates the level of savvy and awareness that they [don't] have for the subject matter. did anyone see the video? he just glued birchwood veneer and typewriter keys on the damn thing. hardly a build. No, it's not a "build." It's a manufactured product sold at an agressive price-point. "Posted by Ashley Strickland", Well Ashley.......... /slap, from 4chan! Heres a new subculture thats "sweeping" the nation................. Its MASTURBATlON! Hammer: Agreed; and the "M" that's sweeping us all into the dust bin is, for the silly, stupid, dumbed-down and irrelevant ones, all a "mental" exercise. Geek Out...Freek Out.....Duh??? Why not seek out the Wizard behind the curtain that the "Blue Pillers" DO NOT want you to see. Man...It's, like...like...like...like...just too much effort, man...like...man? Steampunk is nothing but a big "Blue Pill". A needless...but necessary...diversion to keep punkers from focusing on the really important things going in the world they can't even imagine!!!!! Best news is, I guess, Steampunk is a big seller on internet auction sites. So I hear. Steampunk creates jobs, and should have a huge tax exemption so it can create more. In fact, if this isn't done soon, I'll write my name on the Moon with a giant laser. Even I can see that this article is completely moronic in every possible way. We are all dumber for having read this idiotic and pointless story. A subculture sweeping the nation? Just shut up. Shut up and never write another story again. Please. You make my baby son cry. He's not your son. Check the DNA, sucker. "...a subculture that is sweeping across the nation like a maelstrom". Seriously? While the author may live in this sub-culture, this is only the second time I've read about Steampunk. The first being another article on CNN a couple months ago. No featured stories in the news, no Magazine covers, not talk among friends/co-workers, just these two articles. Not to take away from Steampunk and it's enthusiasts, but please keep exaggerated statements like that out of future articles unless you have facts to back them up. Subculture is inaccurate. It's a literary genre that has spread out into movies like the current 'Sherlock Holmes' and into graphic novels like GirlGenius, and inspired artists and musicians. Jim Blaylock was one of the first novelists to use it, and hundreds have followed his lead. I think K. W. Jeter coined the term, punning on William Gibson's 'cyberpunk.' Gibson and Sterling wrote THE DIFFERENCE ENGINE in 1990; it depicted Babbage's adding machine evolving into a mechanical computer with celluloid punch cards and changing the entire world in the Steam Age. Something is happening here but you don't know what it is, do you, Mr. Jones? Bubba, Steampunk started as a literary genre, but can now be found in fashion, music, artistry, and movies, as well as literature. There are huge gatherings (see WA, MI, and PA), organized local events, and regional groups all over the world who hold everything from afternoon tea to sideshow and burlesque performances. There are even Steampunk bookstores/coffee shops now, as well as restaurants and bars catering to the Steampunk, Dieselpunk, and Clockpunk crowds, and indie record groups (I could name about a dozen Steampunk bands off of the top of my head). Adherents dress in a neo-Victorian influence almost all of the time, some even to their day jobs (guilty as charged). I'm not sure what your definition of "subculture" is, but Steampunk definitely fits mine. By the time a "subculture" (whether you think that's what it is or not) has made it's way into mainstream movies, it's already well established, GRS62, especially in this day and age. Nothing is made anymore without a pre-tested market. You = Moron. I hope you die. "You = Moron. I hope you die." But we won't. Did a literate person do your sister or something? Why all the childish resentment? "Did a literate person do your sister or something? Why all the childish resentment?" Obviously a mad scientist has turned his brain into a waffle and released him to wreak havoc upon the world. Pity the poor victim of Steampunk Subculture, and give to the Society to prevent Science-Related Memetic Disorders. GRS62, Steampunk enthusiasts are just that: enthusiastic. And therefore prone to exaggeration. In the pop culture world, Steampunk is indeed a sweeping phenomenon. Bubba, it is much more than a literary genre. It truly is a subculture. Steampunk enthusiasts LIVE this stuff, donning costumes and attending clubs and conventions (there was a national Steampunk convention in Bellevue, WA last October). At Comi-Con a few years ago, I even saw a wheelchair-bound young woman in costume, and she had that chair totally Steampunked out, complete with fake "gaslight" and a large rotary-engine mounted on the back. If that isn't subculture, nothing is. Leaf, I guess it depends on your definition of 'subculture;' I'm pretty sure none of the cosplayers or artists actually believe they are living in an alternate world where computers and gaslights both existed. I'd say 'fans' or 'enthusiasts' instead of announcing the existence of a new culture; are you prepared to call Bieber fans a subculture? If Biebs or little monsters fit your definition of subculture, then go for it. "Movement" might be more accurate. RJ, there wasn't much market for this stuff at first; it is a genuine phenomenon. No way to stop an idea once people start having it. MAUREEN JEROME Posted on hi, my name is maureen i am extenpicg to complete my 1st degree in accounting and finance early this june and would like to go for further studies in business at lingnan university,i am very interested with your scholarship, please tell me how i can apply.thanks. I'm replying to your reply so that I can be subsubculture. My steampunk submarine will allow me to rule not only the world, but the Sub Culture as well.